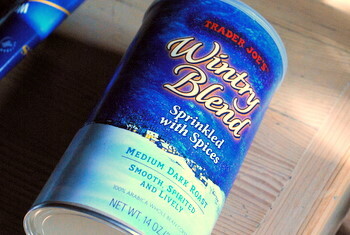 Trader Joe’s Wintry Blend is a seasonal coffee that TJ’s puts onto their shelves every holiday season. It’s usually available until at least January and, depending on what demand is like in your area, you might be able to find it a bit longer than that. Like their Gingerbread Coffee, Wintry Blend is a flavored coffee that is made by adding additional spices directly in with the beans. It includes real cloves, cinnamon and red and white peppercorns, all of which get blended up with the beans. The roast of the beans is fairly dark because they have to stand up to the flavor of the spices, which can be quite strong. The coffee itself has a nice dark flavor to it but becomes a bit bitter as it finishes. This is almost entirely disguised by the bold, peppery spices coming through. They are strong – especially the pepper – make this coffee smell fantastically Christmassy. This coffee isn’t a great one to serve with food, but it’s ideal for serving with cake or cookies on a cold night.